Use this pdf to mail instead of online payment link above. Membership Dues are on an annual basis and will now be from January 1 – December 31. Dues paid in 2018 will be paid until December 31, 2018 and due for renewal on January 1, 2019. Access to the online membership directory with members’ specific interests noted as well as their contact information. Newsletters with important, pertinent information. Significant discounts on the registration fees for the World Congress on Women’s Mental Health. 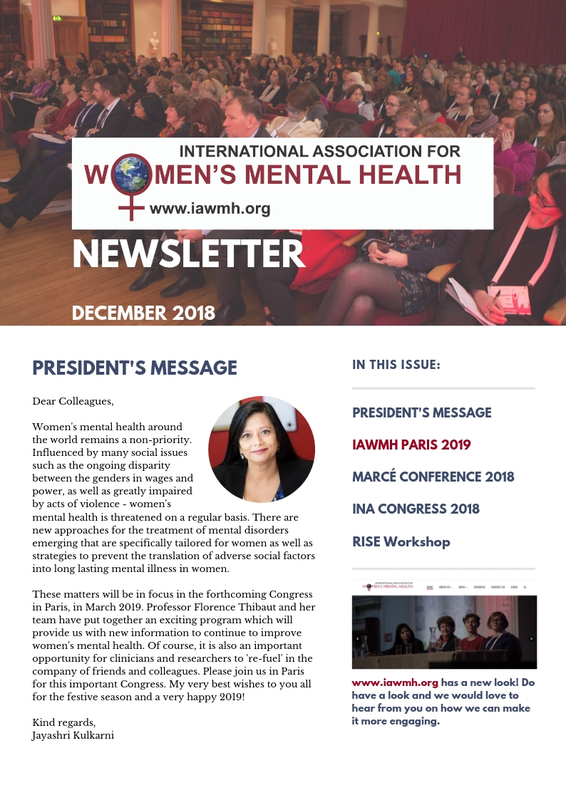 As you know, IAWMH has evolved from a group of mental health professionals interested in the topic to a solid organization that has already held seven international congresses, published a book and gained recognition as a UN consultant. This growth has demanded a lot of effort and resources. We are all aware of your personal effort in participating in our activities, and we appreciate it very much. We also have to cover our expenses and provide some logistics, and for this purpose, the Executive Committee has approved membership fees, as of May 2013.